Fans of “Star Trek” know that at the heart of a star ship’s "warp engines” are “dilithium crystals”. Plasma energy is directed through these crystals which is then transmuted into a warp field that creates a bubble around the ship that allows the ship to move from the "normal space" described in Einstein's theory of "general relativity" and enter into “hyperspace” where the limitations of the “space-time continuum” become suspended. Although this is, at least for now science fiction, it is an application of crystal energy technology that is theoretically possible in the future. In theory, crystals have the ability to resonate with the different energies, thereby strengthening those energies. 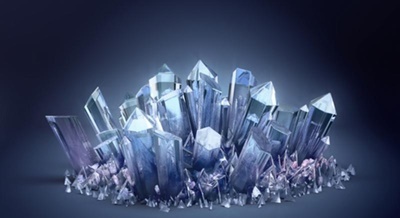 Each type of crystal gives off its own unique form of energy and the particular energy given off by a crystal is determined by its internal crystalline structure and by the atomic vibrations that are specific to that structure. A crystal gives off a very specific narrow bandwidth type of energy vibration because of its crystalline structure causing it to vibrate in a manner that resonates with and strengthens particular energies passing through it. Many of you may remember as children going to the hobby store and purchasing a kit to build a " Crystal Radio", which is a working example of the basic theory behind crystal energy. A crystal radio is a very simple radio receiver that needs no power source and runs on the power received from transmitted radio signals. It gets its name from its most important component, called a diode, which is made from a piece of crystalline mineral such as galena that “catches” the power that is the resonating from the radio waves. The laws of physics tell us that “everything is energy”. Physical matter, despite what our senses appear to tell us, is merely energy appearing in another manifestation. Within each atom of physical matter hides the potential energy of the Sun and that energy lies within everything we see in the physical world, including within our own physical bodies. 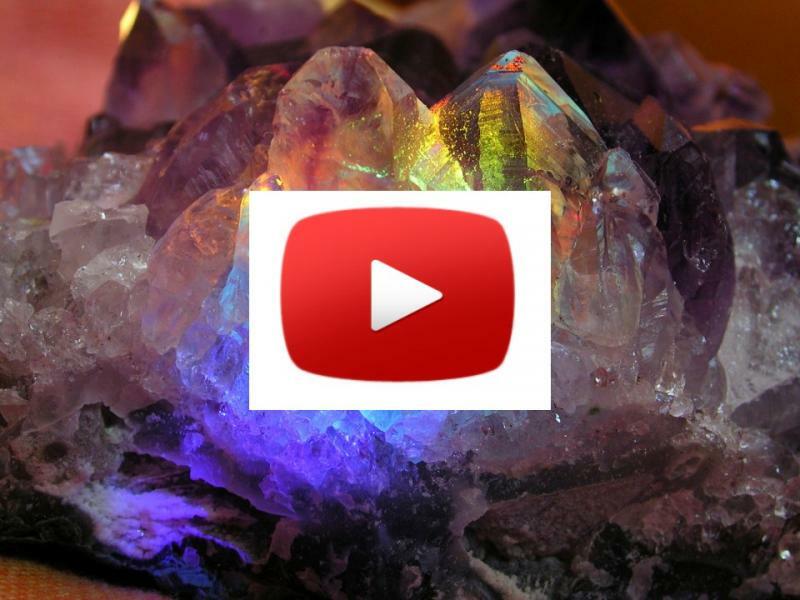 It is for this reason that many people believe in the ability of crystals to affect the energy that resides within the matter that makes up the body. In using crystals in resonance with the energies of the body it is believed that the crystals will have a transforming and even healing effect on the physical body by enhancing and balancing the energies within the body to promote physical and emotional well being. Different types of crystals vibrate at different frequencies and therefore have different applications in the balance and enhancement of energy. For example, quartz crystals vibrate in a much broader bandwidth that amplifies more energy frequencies than other crystals. This is because quartz crystals are not the source of the energy, but instead amplify and then reflect the energy vibrations that exist within their immediate environment. Gemstones operate somewhat differently from crystals. Because of their narrow energy bandwidth a gemstone has a stronger energy focus than a crystal, but only resonates within its own specific area. This means that because of its broader way of operating, a crystal may work to strengthen multiple energies at the same time a gemstones only strengthens the particular energy that it resonates with. A gemstone is best for concentrating a single energy, or for using several different gemstones to work on several different energies simultaneously. When employing crystals for healing, or in purchasing crystals and gemstones to wear or to enhance the areas around you it is best to consult with a qualified crystal healing practitioner in order to determine which crystals will be most effective for you. All healing is about placing the body in balance and the practitioner can ascertain your personal energy frequency and the crystals that will create the proper resonance for healing and balance. The most commonly recognized and most mystical tool of crystal energy practitioners is the “Crystal Ball”. They have been used, as a divination tool, by seers, fortunetellers, psychics, and sorcerers throughout history. The crystal ball is one of the most well-known and popular tools used in the art of “scrying”, which is the name of the ancient technique of gazing into a reflective object such as a mirror or a bowl of water in order to reveal mysteries or in divining the future. When a crystal is used, scrying is known as crystallomancy. 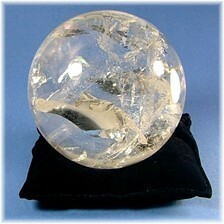 Early crystal balls were made from beryl, but later spheres were made of rock crystal. The reason crystals became important tools for scrying and other metaphysical activity is because of their transparency and the inherent symmetry of their patterns which is said to greatly enhance the energy that flows through the crystal. It is also maintained that the energetic fields within the crystals influence what the scryer “sees” within the crystal on a deep and acroamatic level. Because of the allurement of their beauty and mysterious qualities many people in the general public are desirous of purchasing crystal balls as ornaments. This practice should be discouraged, because of the very qualities that lead to this allurement. 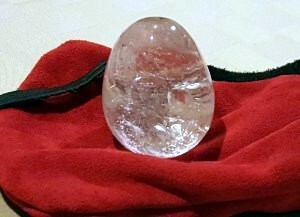 Years ago, when I was about to succumb to the allurement of purchasing a crystal ball from a prominent crystal practitioner, he said to me; “You should purchase a crystal ball with the same considerations that you would in purchasing a puppy. You must be willing to take the responsibility of caring for it and showing it attention; or else it will end up piddling all over the house”. On the surface, this sounds like an exaggerated proposition, but if you consider his reasoning, it is perhaps not so farfetched an idea. Most crystal balls that manifest prominent power are hand polished in order to achieve their spherical shape. If you consider the hundreds of hours that an artisan puts into this hand polishing it is not difficult to imagine the physical and psychic energy that must pass from the polisher into the crystal as it is shaped into a ball. It would be logical to infer that the crystal ball would take on some aspects of the polisher’s intrinsic energy and perhaps even personality, giving the crystal ball what could be considered almost a life force of its own. A crystal ball is a sacred object and it should be treated as one. It should be used only by its owner and caretaker and be kept in a special place of honor when not in use. To pay recognition to its individuality it should have a name, which it will usually tell you this as you work with it. It should have limited handling by other people and should be cleansed regularly, preferably during a full moon, when it is at its peak of its reflective power. For hundreds of years collections of small objects have been used as a tool by people with psychic talent to answer questions about the hidden nature of a problem or situation. Such items as bones, shells, and nuts—left in their original state—are thrown and read. In Obi and Diloggun divination cut cowrie shells are used for the same purpose. Sangoma diviners from the Zulu tribe use bones and other items in a large set which is thrown using a bowl. The Mongolians use four sheep bones known as astralaugus or knuckle bones in a system called shagai. Each side has its own particular conformation and so creates thirty-six possible answers for each query. American hoodoo/rootworkers use small bones along with other small objects;[ Santerians use cowrie shells or coconut pieces. Valiente’s own set was made up of thirteen stones: seven of them represented the astrological planets from the old Chaldean system, that is, Sun, Moon, Mercury, Mars, Jupiter, and Venus. The remaining six represented Life, Luck, Love, News, Home and Magick. Most of the stones’ names are self-explanatory; the Magick stone represents the ruling factor in the reading, the most important aspect. Valiente indicates that the stones are cast within a circle made using the witch’s Cord coiled on top of the reading cloth. Light a candle placed by the cloth. Sit comfortably and hold the stones in your hands and chant, “Ada Ada Io Ada Dia.” Valiente did not know what it meant, but she did say it was an old divination chant which she thought was Celtic in origin. She preferred to consecrate the circle set for the divination before settling in to chant and then cast the stones into the circle. The stones are then read in accordance to how/where they have fallen. Agate is a microcrystalline variety of quartz silica. Agate is one of the oldest stones in recorded history. Acceptance, grounding, emotional, physical balance, strength, healing work, protection. Agates attract strength. Agate is a protection from bad dreams. It also protects from stress and energy drains. Agates have been used in jewelry since Biblical Babylonian times. They were used to ward off storms. They were prized gems in antiquity. The agates with banded colors were placed at the head of a sleeper to give rich and varied dreams. Agates have been thought to be good to harden the gums. Agate is used for stomach upsets. Place the agate on the solar plexus. The agate can't change emotions, but helps to change our level of acceptance of the emotion. Such as when you are very sad the agate will let you know that this will pass and help you get on to another and better day. This is why the Agate is considered so powerful as it gives us the strength to carry on. Carry an agate when you have to make an important decision. Selenite satin spar, desert rose, and gypsum flower are four varieties of gypsum. Gypsum is a relatively common mineral, and may be found throughout the world. Selenite denotes the clear crystal variety that is less common. Granular, massive gypsum is known as alabaster. Do not leave selenite in water! You may rinse selenite with water, but if it is submerged in water for an extended period, it willdegrade. Uses: strengthens bones and teeth, soothes nerves., has positive effect on brain, aiding powers of concentration and clarity, enhances willpower, psychic development. Uses: pituitary and pineal glands, aligns subtle bodies, strengthens the mind, emotional balance, self-esteem, sleep, similar properties to diamondsand quartz crystals..